An abandoned house in San Sebastián de la Gomera, Spain, was investigated by police after calls from neighbors. Inside, they found a wasp nest that almost filled a room! 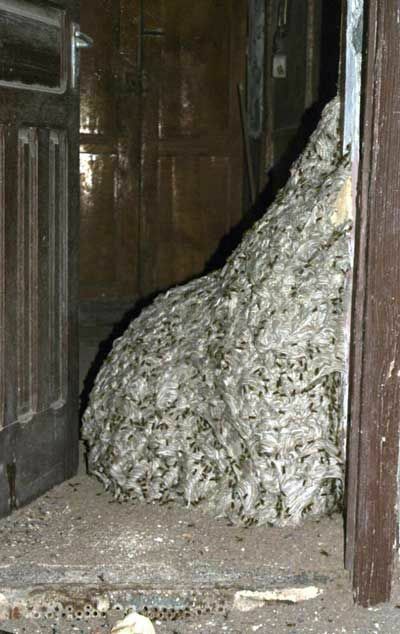 Experts have examined the nest, which is said to be 21'9” in length, and say the common type of wasp found in gardens would never normally build a nest of this size. They believe it must be an invasive species of wasp which had migrated from Africa. The Canary Islands are less than 100 kilometres from Morocco by water. Can you imagine the look on the guy's face who was unlucky enough to be the first to open that door? It makes me want to put on two pairs of jeans, work boots, and my winter jacket with the hood pulled over and snapped tight....with gloves....Then go take a flyin cannonball leap right into the middle of it. The cheese stands alone on that one!